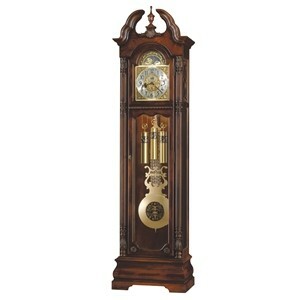 This classic floor clock features a graceful, bookmatched olive ash burl swan neck pediment with a turned urn finial and decorative shell overlay. The brushed satin brass-finished astrological, blue moon phase dial features cast corner and center ornaments with a silver chapter ring and satin black Arabic numerals. The front lower door is framed by a decorative Gadroon molding and carved rosettes. Beveled glass highlights the lower door and bottom sides, while removable fret-cut top side panels with glass allow easy access to the movement. The brushed satin brass-finished pendulum with center-cut disk and weights with decorative bands complement the dial. The distinctive columns feature large reeds and elegantly carved column caps in three locations. 86.25" x 23" x 13.5"